The Eclipse® by Jacobsen® is the walking greens mower of choice for keeping surfaces pristine in all conditions. Its industry exclusive features include variable frequency of cut, onboard backlapping and access to set frequency of cut, maximum mow speed, reel speed, weight balance adjustment and more. Available in hybrid or battery drive; providing power, economy and low environmental impact. 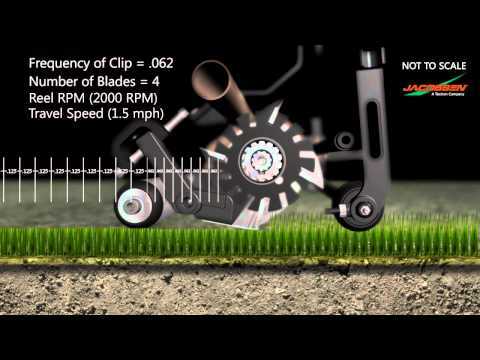 •The ONLY walking greens mowers with variable frequency of cut - for the finest quality cut in any conditions. •The ONLY walking greens mowers with onboard backlapping - to quickly and easily maintain a superior quality of cut. •The ONLY walking greens mower with a fully isolation-mounted engine, which dramatically reduces operator fatigue and excess vibration on the turf, resulting in a better, more consistent cut - day in and day out. •The ONLY walking greens mowers available in hybrid or battery drive, providing power, economy and low environmental impact. •ONLY the Eclipse™ allows for quick and easy reel removal - simply pull three pins, unhook the crossbar and unplug the electrical motor connection. This allows operators to easily mow two different heights of cut with one machine. Transport Wheels: Pneumatic 11 in. x 4 in. Eclipse 118 Models: 18 in. Eclipse 122 Models: 22 in. Eclipse 126 Models: 26 in.